its all going slooooow (Resolved). do the ram sticks not have to match then?...22 quid sounds much better than 60 lol.. It is when possible best to use matching pairs of RAM but when it is not possible for one reason or another as long as the specs of the RAM are the same you should not have an issue. Can`t be done and explaining as to why not is difficult I`m afraid when Windows is installed it is on more than one partition, check your Speccy url and you will see partitions on the HDD that you most likely never knew were there, see if the thread here explains it any better than I can. 1: Extract the Autoruns Zip file contents to a folder. 3: Click on the "Hide Signed Microsoft and Windows Entries” option. 4: Go to File then to Export As or Save in some versions. 5: Save AutoRuns.txt file to known location like your Desktop > when you click on File > Save you will then get the option to Save as type, click the drop down tab, change it to Text and then click the Save button. 6: Attach to your next reply. Autoruns looks pretty clean with only Google and HP updates starting on boot when there is no need for them to, not worth bothering with as it would not change much. Click on Start then Run, type msconfig and press Enter. 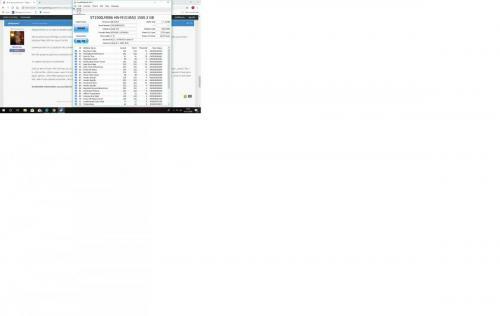 Click on the Startup tab (for Windows 8, the Startup tab has a link to open Task Manager/Startup tab. Use that.) make a note of what is currently starting then click the Disable Allbutton. Reboot and see if it runs better. If yes then use msconfig to enable several items at a time till you find the culprit. If no, start msconfig and click on the Services tab. Check the Hide All Microsoft Services box, record what is currently starting then click the Disable All button. Again, do a regular boot, see if it runs normal. If yes then use msconfig to enable services until you find the culprit. am i ok to stop these ? We are almost out of things to check and other than the following we can only stress test the HDD, we cant do this until all your data has been backed up as stress testing a flaky HDD can cayse it to fail. Run the program, grab any screenshots and attach to your next reply for us. Not quite right but we can see from the info in blue in the top left hand corner of your screenies the HDD is healthy. Upgrading the RAM and lastly a clean install of Windows on its own partition are the only two things left, there is nothing wrong with your computer so there is nothing to fix. should i get the new ram before we do the partition or can we do that anyway ? I would get the RAM first but only when it is appropriate, as mentioned above, there is nothing wrong with your computer so nothing to fix, upgrade the RAM first and see if you are happy with the improvement in performance that you get from that, I suspect that you will be pleasantly surprised. ok bud, ill get it as soon as i can....do we put this topic on hold till then or close it? For computers that have UEFI as opposed to legacy BIOS, to be able to boot from your USB device you may need to disable secure boot and change UEFI to CSM Boot, not all computers and BIOS are the same, please refer to your user manual if you have one as the following steps are only one such example. Restart the computer, Windows 8 and 8.1 from the Start or desktop screen move your mouse pointer over the upper or lower right corner of the screen, when the Windows Charms appear click the Settings Charm, click on Power and then the Restart option. Windows 10, Click on Start,Power and then Restart. cool, i think i will leave the ubuntu till ive changed the ram, we'll see how it goes.. The idea behind trying Ubuntu was to see if the computer was any faster so do it whenever you are ready.